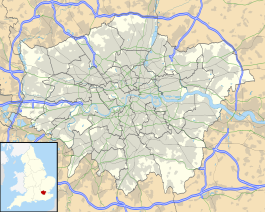 Wanstead is a London Underground station in Wanstead in London, England, on the Hainault loop of the Central line. It is in Travelcard Zone 4. Construction of the station had started in the 1930s, but was delayed by the onset of World War II. The incomplete tunnels between Wanstead and Gants Hill to the east were used for munitions production by Plessey between 1942 and 1945. The station was finally opened on 14 December 1947. The building, like the other two below ground stations on the branch, was designed by architect Charles Holden. It kept its original wooden escalator until 2003, one of the last Tube stations to do so. The station has been extensively refurbished since 2006, including the replacement of the original platform wall tiling, which had become badly damaged. The station is served by London Buses routes 66, 101, 145, 308, W12, W13 and W14, and also by night routes N8 and N55. Wikimedia Commons has media related to Wanstead tube station. This page was last edited on 8 March 2019, at 10:12 (UTC).